Japanese Braised Daikon "Daikon No Nimono". Simmered or braised dishes, also known as nimono, are a staple in Japanese cuisine. Vegetables or fish, or a combination of vegetables and proteins are often simmered together to create dishes that are popular nimono, not just in restaurants, and bentos (boxed lunch), but also at home. 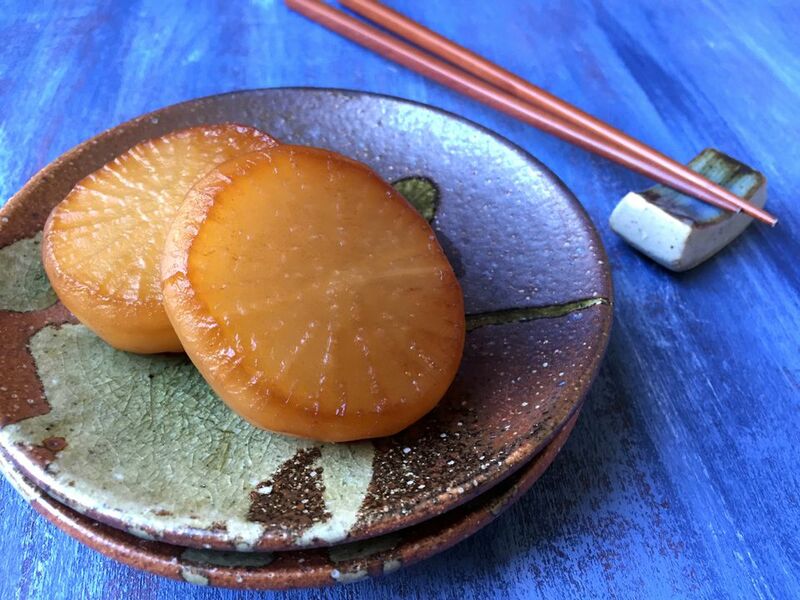 Braised Japanese daikon radish, known simply in Japanese as “daikon no nimono” is a very common dish that is served in the winter when daikon is typically in the season. Slowly simmering the daikon brings out its natural sweetness and highlights the mellowness of this root. While grated raw daikon is often served as a spicy and pungent garnish to different Japanese foods, when daikon is simmered, it takes on a completely different personality and shines as a stand-alone dish. The outer skin of the daikon is thick, so when removing this layer, be sure to remove both the thinner outer skin, as well as the thick layer just beneath it. This can easily be accomplished with a vegetable peeler. After the daikon is sliced into round pieces, for aesthetic purposes, trim a thin strip all along the bottom and top edges of each daikon piece, essentially "rounding out" each piece. This small step really makes a difference in the appearance of the daikon. In a medium pot, add the daikon slices with dashi stock, sugar, and soy sauce and sake (reserve the mirin for later use). Bring to a boil over medium-high heat, and cook for 10 minutes. Skim any foam and impurities from the surface. Reduce heat to low and simmer for about 2 to 2 1/2 hours until the daikon pieces are tender in the center and slightly brown in color after having absorbed the soy sauce. Before all of the dashi is cooked away, stir in the mirin, careful not to damage the daikon. They should be very tender at this point. Turn off heat, and set aside for 10 minutes to allow the ingredients to meld. Serve daikon pieces, with or without some of the simmering liquid, in small individual plates.